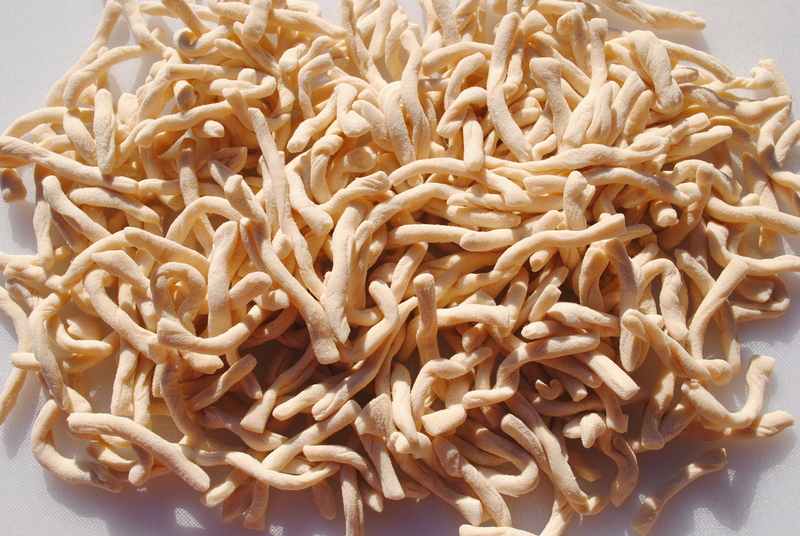 Trofie are an eggless, hand twisted pasta seen in the Ligurian region of Italy (where Samuele grew up). Most often you would see this in the restaurants of the area with a Genovese Basil Pesto, boiled potatoes and green beans all tossed together. That is traditional, but I use trofie as a basic pasta to be used with pretty much any sauce; marinara, norcina [our own sauce, pork, cream, mushroom and topped with truffle salt (most often called the “devil” because it is sooo good!)] or even a simple vegetable saute. There have been recipes found as far back as the 1200’s. Without egg makes it economical, but it does take time to make. This is probably my favorite of the basic pastas because it is so versatile. Ernest and I love your pasta! I served this with pesto and it was amazing.